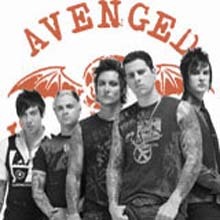 American heavy metal band Avenged Sevenfold was formed in California 1999. They started up as a metal-core band but the music has been changing and are now more on the standard heavy metal or hard rock track. With these Avenged Sevenfold tabs and chords you will be able to play their songs on guitar and bass. The band have debuted in the top spot at Billboard 200 and more than four million Avenged Sevenfold albums have been sold. The list of bands who has influenced them are long so instead of taking bits and pieces from a few bands the sound is more a mix of both underground and well known acts as Bad Religion, Metallica, Pantera, NOFX, Slayer and so on. The band still have many fans and is both a studio and live band.